There is one thing to be diplomatic and try to patch up relations with our freinds across the border, but its an entirely different thing to dump your country in midair literally abandoning 61 years of a nations policy to reach across without a proper plan of action and a commitment to change. More importantly issuing this statement in a whimsical interview half way across the world and more importantly to do it without the consensus of the Parliament. Somehow it seems that our President has a serious need to be trained on how to act and behave like the President of Pakistan, as its been barely a month since he inaugurated his Presidency and has already committed one too many blunders literally not worth writing home about. This ‘casual’ comment resulted in an outrage amongst Kashmiri Muslims opposed to Indian rule, many of whom who regard militant groups fighting Indian rule as freedom fighters. Many protesters took to the streets on Monday, near the Line of Control to display their anger and even burnt an effigy of Mr Zardari. BBC: High Commissioner Hasan said that Mr Zardari was not seeking to undermine “the indigenous struggle by the Kashmiri people for the right of self-determination” in his Wall Street Journal interview. Mr Hasan made his comments in an e-mail sent to various media including the BBC. He said that Mr Zardari had repeated that “Pakistan is opposed to external militants indulging in cross-border terrorism and subverting a genuine indigenous freedom movement”. Correspondents say the phrase “cross-border terrorism” is one that has been used consistently by India, which has accused Pakistan of arming and helping Pakistani-based militants fighting in Kashmir. What we need is an independent team of UN doctors to investigate his mental health, and another team of investigators to find out who certified him as ‘recovered and fit to be a president’. Of course, they can investigate BB’s murder while they are here too. yes, and he is getting worst day by day. One day he can call we can also attack afghanistan like U.S did. Sirf Media ki ghalti hae………aur inn choron ko sir par charhao……..Pakistan needs coup until n unless we don’t get good Political Leaders…..
ab ye hamid mir aur GEO kahan gaya??? ?sab beech dia innn kuttay kay bachon nay…..
what about BLA=Baluchistan Liberation Army. aren’t they terrorist? Mush gave ’em dis label and Zardari&co went and excuse/sorry to BLA despite they’ve committed terrorist acts. The real terrorist org is PPP since BB got married with Zardari. They’ve committed an extra-judicial killing and rampant looting of country treasures. Bhutto and Zardari clan are Kleptocrats instead of democrats. They won’t be able to overcome pak current economy and stability crisis. I’ve no word but to say May Gaad/God Call Zardari soon to his wife. If he doesn’t believe he can get justice for himself in Pakistan how the hell does he plan to give justice to ordinary Pakistani’s. what kind of shithead speechwriters does he have around him? i don’t think Pakistan can afford him for 5 years. They are bunch of craven and venal pols whose aim is to serve their master’s malignant agenda by curbing the Judiciary and allow US-NATO forces to attack inside pak-borders. Well Altaf, Sherry is most probably the shithead chick who produce speeches for her elders. Watch Bilawal Bhutto in below clip. Will we want dis SoB to rule Pakistan in future. Every passing day will increase the tyranny of humans due to some elites who wants to control the world and its resources- and this action will bring us to the Last day of universe. Ofcourse- The banking system (Interest) – as most hated by Allah and its believer will be responsible to bring the demise of human beings. I am very much disappointed that our younger lot is not thinking at all and thats why we are being bogged down. I request to all of you please once read the below protocols to see the bigger picture. The amount of money he has in his bank accounts can feed million and he has not even open a welfare trust to atleast hide his face behind it before raising the slogan… Roti kapra or Makaan. I dont see ANY leader who can stand in front of the banking system which is tieing us throught credit. See the American economy… The most productive economy of the world… has gone down in the drain?? Why because it is based on interest. America is not responsible for our economic downfalls.. The people behind the economic downfalls in every country are the members of that secret group of bankers who is mobilising each country’s resources to make that country slave of them. We cannot stop them… because it bound to happen as said by the Holy Prophet and Allah..
Forseeing, I am scared and cant sleep for what is coming…. May Allah give us the courage to face this.. we are really close to the last era..
May Allah save us and our families from Satan. This was just too much. He also has started acting like a dictator and he’s even getting worst than Musharaf. He certainly is cooking something and it smells real bad. Yes i a frequent reader of his columns and in search of truth I have done a lot of research and found his words wealthy of believing. The articles he even wrote 5 years ago proving the current scenario. Get ready for even worst……and there are people in Pakistan still supporting him blindly………. The Problem is not Musharraf or Zardari or Any of our Leaders…. The Real Problem is ME.U and US ….if we cantget our acts and morals Right…on individual levels…the Please be ready for the Worst to come!!! ASLo the Leaders Coming to rule us will always be based on our Moral Deeds as a NAtion or Muslims. SO Blame ME ..and urself FO we let this Happen!!! He got more then enough time to rectify his english spelling mistakes in jail(ref Gaad, Strent)…but he wasted the all available time planning “How to be president of Pakistan in six months”…finally he got succeeded but Pakistan seems to face even more bloopers from him..
You seem a reader of Henry Makow Ph.D. The magnificent-makow whose articles are worth reading. I've read his almost all listed articles after which I got to know the bigger pic of the world and how and who control it. I provided his link here 1st I guess and if you are reading him with understanding thats a good sign. but brilliant writer whose articles will give you jolts. Well i have some frnds .and they have lived in kashmir.they also say that kashmiris have some reservation to pakistan.and like to be an independant state.. 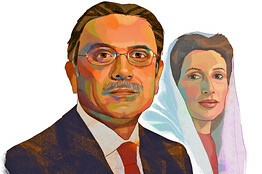 Regardless of Mr. Zardari’s real intentions in strongly hinting at a major policy shift, it is unlikely that a US-led bailout of Pakistan would be forthcoming at a time when the US economy is headed into a recession, limiting the options open to any incoming administration in Washington. Than dear leave the country ,have fun abroad.Pakistan is not a Heaven for rich Millioneres anyway or have you lost Billions in US and European Capitalist collapse? Let us ask staright,what are you getting out of it? terms of Zardari business empire? So MR 10%, when you going to label every Pakistani as Terrorist? Latest pic of Asif Zardari sipping champaigne????? Grow up CheckThisOut, if you are going to say some thing, at least avoid being pathetic, is this the worst you could come up on Zardari? Do you know that charging interest doesn't mean taking advantage of someone's situation? Today you lend someone 100 bucks. Years later, when the compounded inflation is 100%, if the guy returns you your money, you can buy just half the goods, you could have had bought 100 years back. So, if the goods don't decay, i.e. a piece of land, why won't you rather buy land right away than store/give the money to someone else? If you lend money interest-free that would be charity because the present value of the sum that you are gonna receive will be less than what it is now, and thus you will incur loss straight away, which can be called charity if you want. So, if you say that each time the money lent should account for some charity work, it's OK. But don't say interest charging is ideally profit-making. In real life yes, interest charging does result in profit making because of different ways in which one values the goods. I went through some of the "Sharia-based financial products". They all charge interests. The interests are hidden as service charges, upfront fees, etc etc. But in effect they all mean interest. I don't know how much I can get through you depending on how much knowledge of finance you hold. But try to understand, if there is no interest, people will actually LOSE money. It is not a no-gain situation. The true freedom fight for Kashmir was set aside in the previous generation. Now is the copypaste of terrorists or Talibanism. Zardari is the most popular personality living in the pak people hearts after his wife's murder by terrorists which must be abolished from the face of Pakistan including Kashmir. bring back the true freedom fighters, not bloody terrorism in the name of peaceful mohamadanism. kashmir is not a piece of cake, dont forget.